…with “risk on” back on track, why then would “safe haven” bonds be attracting such keen interest? German 10-year bund yields sank eight bps this week to nine bps (0.09%), the low going back to October 2016. Two-year German yields were little changed at negative 0.58%. Ten-year Treasury yields declined five bps this week to 2.64%, only nine bps above the panic low yields from January 3rd. Japanese 10-year yields declined another basis point this week to negative three bps (negative 0.03%), only about a basis point above January 3rd lows. Swiss 10-year yields declined six bps this week to negative 0.33% – the low since October 2016. It has now been a full decade of near zero interest rates globally. Trillions (estimates of around $16 TN) of new central bank “money” were injected into global securities markets. What’s more, global central banks have repeatedly intervened to buttress global markets – from 2008/09 crisis measures; to 2012’s “whatever it takes”; 2016’s “whatever it takes to support a faltering Chinese Bubble”; to last month’s Powell U-turn. The combination of a decade of artificially low rates, an unfathomable amount of new market liquidity and an unprecedented degree of central bank market support have fostered momentous market structural maladjustment. We’re living with the consequences. Speculative markets reversing to the downside rather quickly unleash “Risk Off” dynamics. These days, de-risking/deleveraging abruptly alters a market’s liquidity profile. Not only is there the liquidation of holdings and the collapse of leverage, the resulting downward market pressure triggers risk aversion more generally for this imposing global pool of speculative finance. And as the ETF complex suffers outflows, the leveraged speculating community and derivatives industry move to shed risk ahead of a retail investor panic. And when a meaningful component of the marketplace seeks to hedge market risk, it’s difficult to envision who takes the other side of such a trade. Meanwhile, major shifts in dynamic-hedging programs unfold throughout the derivative universe. When markets are running on the upside, derivative-related buying (i.e. hedging in-the-money call options written/sold) exacerbates already powerful trend-following flows. But when a speculative upside (i.e. “blow-off” or “melt-up”) market advance eventually reverses course, derivative-related buying swiftly transforms into destabilizing selling. For example, a quant model used for (dynamic) “delta hedging” exposures from derivatives previously written (i.e. call options) would halt aggressive buy programs – immediately becoming a seller into market weakness. Meanwhile, sinking markets will see keen interest in buying downside derivative protection (i.e. puts) – both for speculation and hedging. The sellers of these derivatives will then dynamically hedge these instruments, which essentially require selling into declining markets. Using out-of-the-money put options as an example, the amount of selling required to protect the seller/writer of these instruments expands exponentially as market prices approach option strike prices. The point is, derivatives tend to play a significant role in promoting destabilizing upside market moves, dislocations that are then highly susceptible to reversals and destabilizing market breakdowns. Why have risk markets rallied so strongly to begin 2019? Because the Powell U-Turn incited a reversal of short positions and the unwind of bearish hedges and speculations. Derivative-related (“dynamic”) selling – that had been rapidly gaining momentum – reversed course and became aggressive buying. Market momentum then incited buying from the enormous trend-following/performance chasing Crowd. Who can afford to miss a rally? Certainly not the global leveraged speculating community, with many at risk of losing assets, incomes and businesses. Why have safe haven assets performed so well in the face of surging equities and corporate debt? Because current Market Structure is inherently unstable and increasingly prone to an accident. Today’s buyers of Treasuries, bunds and JGBs are less concerned with January/Q1 equities and junk bond returns, keenly focused instead on acute global market instabilities and the inevitability of a systemic market liquidity event. 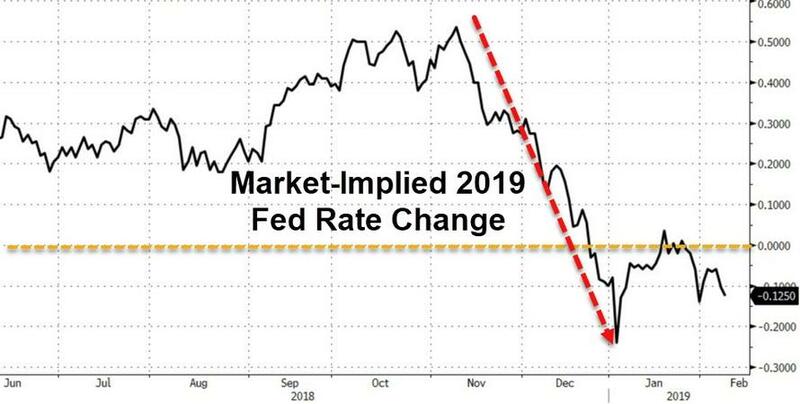 I would further argue that this dysfunctional market dynamic recalls the destabilizing rally in Treasuries and agency securities in 2007 and well into 2008. This market anomaly stoked end-of-cycle speculative Bubble excess and exacerbated systemic fragilities. When risk markets advance, news and analysis invariably focus on the positives – an expanding U.S. economy, prospects of a trade deal with China, buoyant profits, a backdrop of ongoing exciting technological advancements, perpetual low interest rates, endless loose financial conditions, etc. With markets advancing, mounting risks are easily disregarded. “Deficits don’t matter.” Debt concerns are archaic. Market Structure is a nothing burger. Best to ignore escalating social, political and geopolitical risks. The unfolding clash between the U.S. and the rising China superpower – it’s nothing. An increasingly fragmented and combative world – ditto. As we saw in December, sinking markets direct attention to an expanding list of troubling developments. Years of inflating securities prices seemed to demonstrate that so many of the old worries were unjustified – none really mattered. The problem is that many do matter – and some tremendously. The current extraordinary backdrop has all the makings for a decisive bearish turn in market sentiment that would create a problematic feedback loop within the real economy – domestically and globally. This entry was posted on Sunday, February 10th, 2019 at 12:50 pm and is filed under Immediately available to public. You can leave a response, or trackback from your own site.